Cycling is becoming more and more popular in Canada. 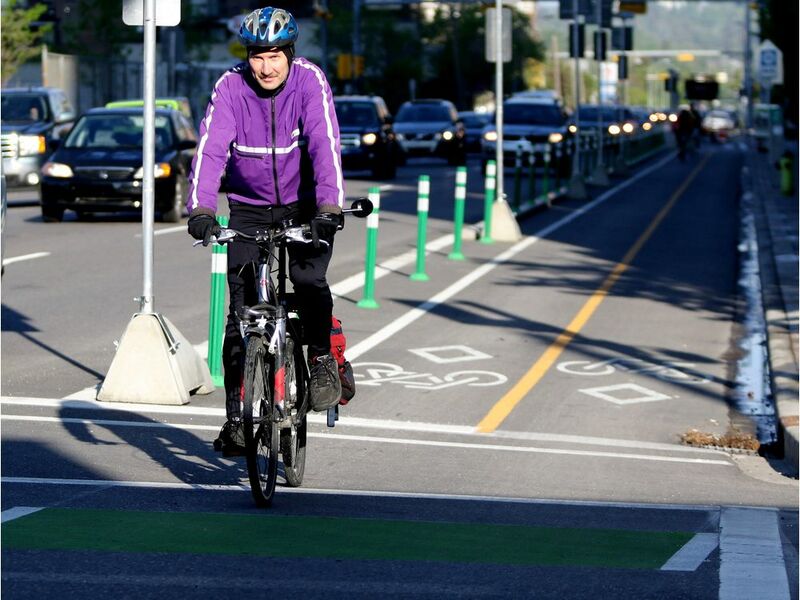 In Edmonton alone, the number of cyclists on the road has nearly doubled since last year and is still growing. With so many more bikes on the road, there’s been an unavoidable hike in driver-cyclist interactions. The result? A whole lot of frustration and confusion among drivers who don’t know how to drive around cyclists. But whether you like it or not, cyclists and bike lanes are here to stay. So, instead of living in denial, you should learn how to share the road. Here are seven essential tips to follow when you drive around cyclists. This is the golden rule you must follow to drive around cyclists correctly. Drivers and cyclist have the same rights and responsibilities, which means the road doesn’t belong exclusively to vehicles. So, as a driver, you must allow the cyclists the space they need to use the road safely. When passing, make sure to leave cyclists plenty of space. Most provinces recommend you give cyclists a one-metre clearance, but sometimes that isn’t enough. There could be potholes or poorly parked cars forcing the cyclists to the center of the lane. In such cases, a metre gap won’t be enough. Just imagine the cyclist was to tip over towards your car unexpectedly. Would the cyclist be at risk of falling onto your car? If the answer is yes, you should give the cyclist more space. When you’re stuck driving behind a cyclist and passing isn’t a safe option, always leave them a wide gap. Unlike cars, bikes don’t have brake lights to let you know when they are slowing or stopping. For that reason, you should treat cyclists with more caution than you would another vehicle and leave them more space. Finally, even though cyclists are encouraged to stay close to the curb, they aren’t obligated to do so. Often times, like when cyclists are preparing to make a left turn, or when weather conditions force them to, they will move away from the curb and take a larger presence on the road. As a motorist, the only thing you can do is be patient and grant cyclists the space they need. It’s every cyclist’s worst nightmare, and countless videos on YouTube show that it happens way too often. You could be biking along happily, respecting every rule of the road ever invented, when BAM! A driver opens their car door and clotheslines you with the force of ten Dwayne Johnsons. This is called “dooring”, and it could end if drivers simply started checking for passing cyclists before opening their doors. After parking on the side of the road, check your blind spots and look for cyclists before opening your door. If you’re exiting one of the doors on the driver’s side, open the door with your right hand. This will force you to look over your left shoulder before you open your door. If you’re exiting from the other side of the vehicle, use your other hand. This technique is called the “dutch reach”. Do it until it becomes second nature. Whenever you’re making a right turn, use your signal light and check your blind spot for any approaching cyclists. Cyclists can be hard to spot. You may have passed one without noticing, or one may be rolling up with speed. To avoid cutting anyone off, take a quick look over your right shoulder for any approaching cyclists. Another thing to remember is that you must always make sure the bike lane is clear before you cross it. Drivers will often assume the right of way through a bike lane, forcing cyclists to slam on the brakes or make dangerous maneuvers to avoid being hit. Sometimes, cyclists can’t react quick enough, and end up taking a face-full of door panel. This is a recurrent problem around alleyways downtown. As drivers exit alleyways, they will move right into the bike lane without first checking for oncoming cyclists. They’re trying to get better view of the road they’re turning onto, but they sacrifice the safety of bike lane users doing it. Instead of dangerously darting in the way of bikes, slowly inch forward and make sure the coast is clear. Then, once you know it’s safe, you can proceed through the bike lane. To drive around cyclists safely, use your signal lights. Yes, it’s an obvious tip, but it must be said. Some drivers seem to be under the impression that cyclists (and other cars) can read their thoughts. These drivers make lane changes and turns unpredictably and seem utterly oblivious to the cyclists swerving to avoid being hit. Don’t be one of these drivers. What you should do is signal long before turning or changing lanes. That way, your intentions will be made clear to everyone on the road. To signal left turns, cyclists will extend their left arms straight out in the direction of the turn, horizontally. Using their left hands, cyclists will signal right turns by extending their left arms out sideways bent at a 90-degree angle at the elbow joint. Their hands will be pointed upwards, and their palms will be facing forward. In some places, cyclists will indicate right turns by extending their right arms straight out in the direction they’re turning, similar to how left turns are signalled. When cyclists are slowing down or coming to a stop, they will extend their left arms out towards the ground (sometimes with their elbow bent at a 90-degree angle). Their palms will be facing you, and their fingers will be pointed down. Don’t expect to see cyclists making this gesture every single time they have to slow down. If they must come to a sudden stop, taking a hand off their brakes and handle bar could be dangerous. That’s why it’s important to stick to Tip #1: share the road. Cyclists don’t have the luxury of windshields and are thus much more susceptible to the elements than drivers are. They can be blown off course by intense winds, have their vision impaired excessive road dust, or have a tough time slowing down because of rain. No matter what the conditions are, they have a larger impact on cyclists than on cars. What you can do to help is give cyclists the space to deal with the conditions. Be patient when bikes are going slow – they could be battling the wind. While you should be careful every second you’re behind the wheel, certain situations are particularly dangerous for cyclists. In these situations, take extra precautions and drive slowly. As you’re driving through an intersection, scan for cyclists waiting to turn left. Although it’s risky on busy roads, cyclists are permitted to turn left like cars do. Always be careful to stay in your lane and not side-swipe any cyclist in the intersection. Oh, and when you yourself are waiting to turn left, you must wait for oncoming bikes to clear the intersection before turning, just as you would for another vehicle. People don’t need licenses for cycling on roads or bike lanes. Anyone of any age can use them, and that includes children. Children may not be fully aware of all the rules and dangers of the road. What’s more, children aren’t experienced riders, and they could easily lose control of their bikes. For these reasons, always be on the lookout for kids on bikes. Drive extra slow around them. These were the ten essential tips to learn to drive around cyclists. Put them to use and you’ll start to feel comfortable about sharing the road with cyclists in no time. For more driving tips and to have all your automotive questions answered, visit our blog!